The boat docks at Alum Creek State Park are shown prior to a storm. The docks and marina will receive $4 million in renovations. 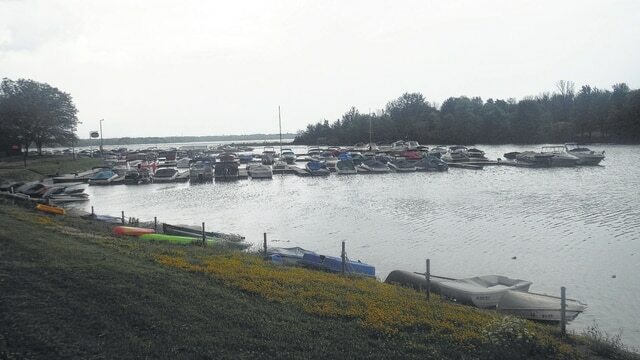 A $4 million renovation of the Alum Creek State Park Marina and docks is about to begin this summer, but may not be completed until 2018. Next week, engineers will look at the marina and docks, and begin the design process. Miller said that any work would not be done during the summer boating season. At a meeting Thursday in the Geo Survey Learning Center on South Old State Road, Miller urged a room filled with boat owners to offer their ideas now, not when the construction is already taking place. One idea was to open up more docks, but Miller said the U.S. Army Corps of Engineers may not allow it. Other ideas include: Removing parking blocks, making the docks handicap-accessible, reducing dock fees, Wi-Fi capability, and tougher enforcement on day-dockers who make a wake in a no-wake zone. Of the latter, Miller said watercraft officers are going to give more safety inspections, and then decide whether to warn or ticket the boater. He also discussed contacting authorities when there were any violations. Some work on the existing docks is being done, such as providing stainless steel cable for winches. Divers from the Columbus Police Department did the installation for free as part of their training. In addition, college students are cleaning the park’s toilets twice a day. Finally, misplaced buoys will be moved to where they belong, using GPS coordinates. Miller said the department has traditionally received less funding than other agencies, but Gov. John Kasich has committed $88 million in upgrades to the park system this year. He said a lot will get done in the next two years, and promised better communication with the boat owners.